He got my heart in his hand and my soul in the other. Tsunami Mob singer/songwriter, Samaria is here today with a new short film for "Story of Right Now," which takes us along a wild ride of falling in love with a bad guy. From their first encounter, the relationship comes together quickly, but their romance takes a turn as she finds herself wrapped up in his dangerous lifestyle. 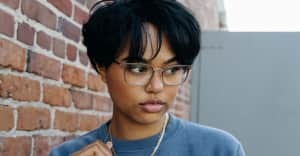 Samaria explained the inspiration for the video in an email to The FADER, "I wrote 'The Intro' when I was going through withdrawals after a break up. One of the things my ex would tell me is that I was never honest with myself so this song was kind of my laying everything out on the table, righting my wrongs not for him but for myself." "I wrote 'Right Now' as a tale of the girl who fell in love with the bad boy, I've always been infatuated with story telling in music so this was my first shot I took at doing it." Enjoy the video above and check out Samaria's EP Story of Right Now.